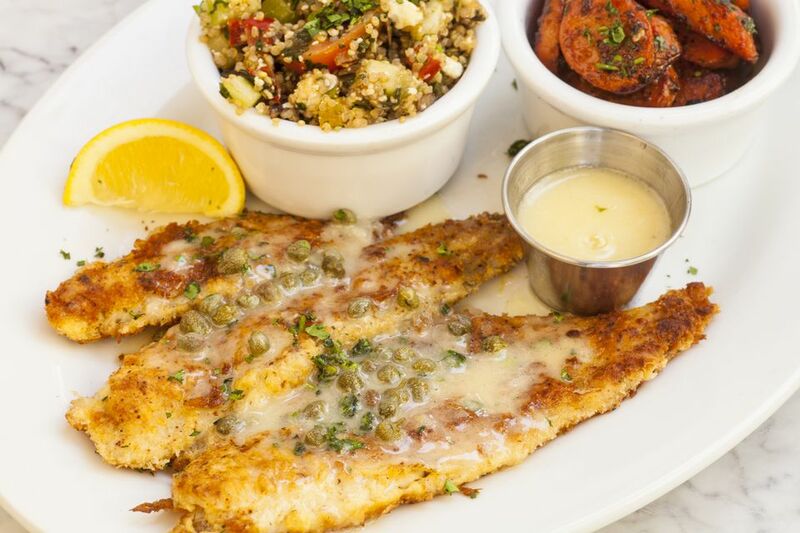 Sanddabs, also spelled "sand dabs," are a regional delicacy on America's Pacific Coast. They are little flounders that most cooks fry very simply in oil. This recipe uses the old Spencer Method of oven-frying, which uses a bit less fat—though it's no less caloric, as you'll be covering the fish in homemade mayonnaise before rolling them in breadcrumbs. Serve this with a chunky, summery salad of tomatoes, avocado, sweet corn and sweet onions for a delicious, casual meal for family or guests. You don't have to make your own mayo; good quality store-bought is really just fine. But mayonnaise is easy to make and homemade tastes so much better, and it really is worth the little bit of extra time for an especially delicious meal. To serve, take the fish out, let them rest a minute or two, then arrange one or two on a plate with the golden brown side up. The breading will not be crispy, but it will be savory and is intended to complement the lean and moist sand dabs. A rich white wine like a Roussanne or a buttery Chardonnay is good with this, but so is a lager or pilsner beer. In a bowl, add the egg yolk, lemon juice, water, and kosher salt and mix well with a wire whisk. Slowly add in the olive oil while whisking furiously. Once you have any given amount of oil incorporated, you can rest a bit, then continue adding the remainder. Your mayo will be yellow and softer than the white store-bought version. It will also be more perishable, so put it in the fridge for now. Preheat your oven to 475 F.
Cut the tomatoes into large chunks, then do the same with the avocado, and put them into a bowl. Cover with the lemon juice. Add the finely chopped sweet onion and the parsley, then add the sweet corn. Use a stout knife to cut the kernels from the cob of corn; sometimes it helps to cut the cob in half first. Mix everything together gently—don't mash the avocado—and add olive oil, salt, and black pepper to taste. Cover with plastic wrap and leave at room temperature. Take out the fish and the mayo and fill a shallow, wide bowl with the breadcrumbs. Brush or hand-rub mayo thickly onto the sanddabs, then, holding them by the tail, lay them one at a time into the bowl of breadcrumbs. Pick the fish up by the tail again and flip the other side onto the breadcrumbs. Make sure they are well-covered. Gently lay the fish with the dark skin facing up on a heatproof pan, cookie sheet, oiled foil or whatever you intend to cook them in. A baker's silicone sheet over a cookie tray works particularly well. Cook in the oven for 6-12 minutes until the fish is a nice golden brown. Do not flip.